Do you have a unique pet that gets into anything and everything that they can find? Have you ever felt concerned about glue, as strange as it may seem? Our pets can get into some of the most bizarre things. We all know how our children would put anything in their mouths when they were infants. Our pets are even more curious and unaware of what is and is not safe for them. We as the pet parents have to be so careful about anything and everything that is within reach of our beloved four-legged family members. Most of us have glue in our homes for various reasons, such as school work, crafts, home repairs and more. The glue that may leak or in any way become accessible can tempt your curious dog. When we realize something is toxic to our pets we try to keep those items out of reach. Not all glue is toxic to our pets such as super glue which contain ingredients like ethyl-2-cyanoacrylate 50 100% and poly (methylmethacrylate 2-30%). The ingredients cause a rapid, high adhesion upon contact with another surface. These types of household glues are not the expandable type glue, and ingestion may cause a mild oral irritation. There is a particular type of expandable glue that we need to be especially cautious. Common names for this water-activated glue are commonly called Gorilla Glue, Probond, Titebond, and Ultimate Polyurethane Glue. If your dog ingests any of these glues, it can be quite serious, requiring surgery. When this glue is ingested by your dog and gets into the stomach, it becomes activated by the stomach fluids. An ingredient called Diphenylmethane diisocyanate which expands and just gets larger and very hard when in a warm, moist environment. Your dog will not be able to pass it, digest it or vomit it. You may not always witness your dog getting into the flue, but typical symptoms may be a lack of appetite, excessive drooling, swollen stomach which is tender to the touch, and gagging or vomiting. A hard stomach warrants immediate vet care. The only solution is surgical removal followed by an overnight stay and intravenous fluid therapy. Upon returning home with your dog, your veterinarian may prescribe antibiotic drug therapy and a soft diet for at least a week. The labeling on these gorilla type glues does not give much warning to its dangers other than “do not swallow” so it is your responsibility as the pet parent to keep this and all toxic items out of the reach of your dog. It is for your dog’s own good, and well-being. Dogs can be infected by a bacterial known as Tuberculosis. There are two bacterial types of tuberculosis, Mycobacterium tuberculosis, and Mycobacterium bovis tuberculosis. Tuberculosis (TB) is not only a respiratory condition but can also affect the intestines. TB most often gets into the lungs (the primary target) as well as distressing the nervous system, lymphatic’s, genito-urinary tract, as well as the bones and joints. If left untreated, the disease can be fatal. Mycobacterium tuberculosis, which is most commonly affecting humans, can also be passed onto our pets as well through airborne contamination, i.e.,., coughing and sneezing. This is a slow-growing intracellular organism, with only about 5% of those infected with the bacterium developing the disease. The Mycobacterium bovis tuberculosis mostly affects cattle and wildlife, though humans and pets alike can be infected through consumption of contaminated dairy products and infected meat. This form of TB has hard to diagnose signs of the disease in your dog until the disease is extremely advanced, leaving few treatment options. It seems to affect young dogs as well as the aged and dogs with a weak immune system. The disease is passed on through sneezing and coughing, spread between dogs and humans. Most often a dog gets the TB from an infected person. Some of the common symptoms besides coughing and sneezing may be depression, weight loss, dehydration, vomiting, increased thirst, urination, and jaundice. TB can sometimes be tough to diagnose. In treating the TB, the dog undergoes numerous tests. Additionally, biochemical profile, blood count, a TB skin test, x-rays and culture along with cytology may be necessary for diagnosing your pet. The TB skin test was first developed by Koch from the glycerine extract of the tubercle bacilli. What happens is that the dog with TB is highly allergic to tuberculin substances. When injected through the skin test, there will be a hypersensitive reaction on the surface of the skin. Prognosis for dogs most often is not okay, and we can only hope our pets are never affected by this disease. On rare occasions, a drug treatment plan may be put in place by your veterinarian if your dog has been diagnosed at a very early stage. You can work on building up your dog’s immune system, with proper nutrients and supplements (per the advice of your veterinarian). There will be a better chance for your dog’s resistance to TB and recovery. In areas where there is the presence of wildlife and cattle, you may take some precautionary steps to keep your pets free from contracting the disease. Keep dogs indoors unless adequately monitored and don’t allow them to have access to unpasteurized dairy products or dead meats. Be cautious if any humans in the home have contracted the disease. Since the bacteria are so quickly passed on, be sure to seek medical attention immediately and determine measures to protect your dog. The parvo virus can be critical for your puppy if not treated early on. The last thing you want is to put your new canine member in danger from the start. That tiny little creature is depending on you for its health and well-being. Many pet parents have concerns about mandatory vaccinations for their dogs. What is necessary for the life and health of your pet? Vaccinations were not always available. One of the fatal diseases to consider is the parvovirus. This virus started appearing back around 1978, and since then, the cat feline distemper vaccine was developed. Further studies led to the creation of a vaccine for dogs as well. Puppies are very susceptible to the virus if not vaccinated at an early age after being weaned from their mother’s milk. Without treatment, 80% of affected puppies could die. With treatment, 85% of animals will survive. Parvovirus is caused by a highly contagious virus through dog feces. The virus only contains DNA and RNA and is not capable of reproducing unless it invades a cell within the body where it continually multiplies. As it reproduces in abundance, the cell can burst, release new virus particles into the bloodstream and tissues. Other cells are then invaded. The only protection is the immune system. A microscope is necessary to view this little virus. As with many viral diseases of the intestinal tract, it can be passed on from dog to dog without any visible symptoms. The incubation period for the virus is average between 4 to 14 days when you may notice clinical signs of vomiting and diarrhea. Diarrhea will be yellow to yellowish gray at first, becoming tinged with blood very quickly. There is no direct anti-viral medication to treat Parvovirus. In treating the affected puppy, it is important to keep it hydrated, making sure the electrolytes are balanced. Intravenous fluids may be administered along with certain spectrum antibiotics and/or antiemetic drugs. Your veterinarian will know the proper treatment, medications, and hydration. Hospitalization may be required. If your puppy survives the first four days of treatment, it is very likely he/she will survive the parvovirus infection. Prevention is the best treatment you can give your puppy. New puppies get the antibodies they need from the colostrum of their mother’s milk. Once they are weaned, they rely on you to protect them from all dangers. According to your doctors’ recommendations, a vaccination regimen will be prescribed for your puppy beginning around the age of six weeks old. Those treatments will include warding off the possible deadly disease of parvovirus. Don’t put your puppy in jeopardy. His/her life is now dependent upon you, your total love, dedication, and proper care. The rewards will be endless as you have saved the life of your loving little puppy and new family member. If you are looking to adopt another Chihuahua, don’t forget such places as the Chihuahua rescue organizations. Many of those orphaned dogs are seniors who are very deserving of love and a home. Many homeless pets in shelters are just hoping and waiting for the right family to come along. Of course, before you go to adopt a new pet, you have some major decisions to make. What age dog, what size, do you want a very laid back dog that is good with children, an active dog, or one that just lies around and cuddles? When it comes to age, most people opt for the adorable little puppies and young dogs. That is great as they sure do need a loving home and companionship. You, unfortunately, pass by the senior dogs. Most people feel the older dog is not “worth the money” because the animal’s lifespan is shorter. But there can be many benefits to a more mature dog. They deserve to find loving homes too, don’t you think? Don’t they deserve a high-quality life for their remaining years? There can be many reasons an older dog(s) can end up in a shelter. Maybe there the previous owner has passed on, and there is no one else to take the dog which is sorrowful. The former family has lost their job, home or is moving to a new home not allowing a dog. Maybe there is an illness or a divorce in the household, and the dog is given up either because of the expense of caring for it or “it is in the way” and given up. There are many unfortunate situations where the family pet is given up which I am sure in most cases is tough. Adopting a senior pet has its perks. The dog is already housebroken and in the majority of the cases a very loving companion with a predictable temperament. These dogs that were used to a family situation before getting displaced are perfect for a new family that wants a dog to love and be loved. A senior dog could be the perfect companion for a senior citizen. No need to go through housebreaking the new buddy and the exercise and activity levels of these dogs are lower than that of a younger dog. There are other benefits to adopting an older dog beside the housebreaking issues such as no problems with teething; older dogs are more focused and mellow. They comprehend what “no” really means, they can quickly settle into their new environment, loaded with lots of love as your new adoptee is so grateful for the second chance you have given it. As a senior pet, they do not make as many demands on you as a puppy would. They are accustomed to personal schedules and sleep well at night. The senior dog makes an excellent companion. If you are looking to add a new member to your family, give great consideration to saving the life of a senior aging dog. Your love and companionship will be so greatly appreciated and returned unconditionally. As a dog owner, there is always much more to learn about caring properly for your pet. For most, a dog is a member of the family and spoiled rotten; and so they should be. At least, spoil your pup within reason; no individual settings at the dinner table or anything that could cause harm. These are just some friendly reminders for the avid responsible dog owner; questions or concerns you may have. First off, water is a number one necessity for dogs. All dogs should drink between 20 and 40 ml of water per pound of dog weight each day. In layman’s terms, that is 3 to 4 cups of water for a 20-pound dog. Dogs fed a canned food may require less than those strictly on dry food since the canned varieties contain a high percentage of water. So, the next question may be – can a dog drink too much water? The response here is that, if your dog regularly drinks a lot, it is no problem. If your dog suddenly starts drinking much more than usual, it may be a sign of illness such as diabetes or kidney disease. Another concern of most pet parents is dog obesity. As many as 25 to 40 percents of household pets are obese, which is extremely unhealthy for your pet. Among many other problems, obesity on a dog causes a lot of strain on that tiny little heart. If your dog’s abdomen protrudes from the sides or has fatty areas on the sides of the tail or hips, your pup may need to shed some pounds. Obese dogs seem to waddle when they walk as well. Your dog may appear to be a happy dog, but he or she does not know what is best. Besides heart difficulties, obesity can lead to depression, joint pain, and other complications. Obesity occurs from too much food and not enough exercise for your pet. Consult your doctor or pet store staff member for low-calorie dog food choices comprised of natural ingredients. Along with a diet change and decrease in food, it is necessary to increase the exercise regimen according to the breed of dog and its age. Training can include play time such as tossing around a ball, Frisbee or favorite toy for a game of fetch along with daily walks. Even while providing a healthy diet for your dog, it does not mean you cannot spoil him or her with an occasional treat. There are healthy alternatives for treating your dog such as fresh baby carrots, tiny piece of fresh fruits or other vegetables along with providing low-fat dog snacks. Treating your dog has nothing to do with quantity so half a treat will bring a lot of joy to your pet. It is all in the thought and quality time together. Responsible pet owners want to do the best for their pets, and that means you. Spoil your dog and provide all its necessities as long as you have its health and best interest at heart. Where would you be without the unconditional love, loyalty and devotion of your dog. When it comes to the holidays, celebration would not be complete without showing your pet how much you appreciate every wag of the tail and sloppy wet kiss of affection. In showing your pet your appreciation at this special time of year, it is important to consider the pros and cons of the holiday when it comes to your dog’s safety. Thanksgiving is such a busy, hectic holiday, with lots of foods, drinks and goodies. Your dog may love all the extra company and attention, but it may soon become too stressful for your pet. Most animals survive on a regular routine, and Thanksgiving is anything but routine. Along with the hectic schedule, there is a lot of tempting food sitting around, very appealing to the pooch sniffer. Showing your love to your dog does not mean you set a place at the table; on the contrary, that can cause your pet more harm than good. Also take precautions by not allowing any foods, including the infamous turkey from being accessible to an inquisitive, hungry pooch. Thanksgiving consists of lots of fatty greasy items that disagrees with your dog’s system, especially the scrumptious turkey skin. Eating such foods can cause pancreatitis, vomiting and diarrhea. The last thing you want is to end up at the veterinarian’s office, while all your guests are living it up at home with the festivities. When it comes to the holiday, try to keep your pet on its normal routine as much as possible. Try a little fun time such as a walk, jog or tossing a ball around before the festivities and at day’s end to work off some of the extra foods enjoyed at the Thanksgiving table. Avoid giving treats of the holidays to your dog and also inform your guest to do the same. 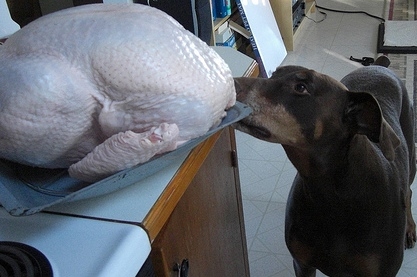 A teeny bit of lean turkey added to your dog’s dinner will not hurt but keep it to a minimum. If you have a dog that gets easily stressed, preparing a dog-safe room with bed, blankets, toys and water away from the festivities, hustle and bustle may be an option for the pet’s safety. As a little reminder, ensure that your trash is completely sealed off so that your pet cannot access it and rummage for “goodies.” There are a lot of dangers that lurk within that garbage, including turkey bones, butter, fat, string for tying up the turkey and more. It all takes a little effort to ward off the dangers of the holidays when it comes to showing your appreciation for all the family, together with your canine. Have a happy and safe Thanksgiving.